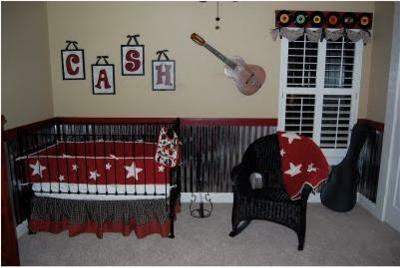 My son Cash's Vintage Music Baby Nursery was inspired by an idea I had one day when I saw my husband's guitars sitting in the office. I can't remember the exact names of the paint colors. 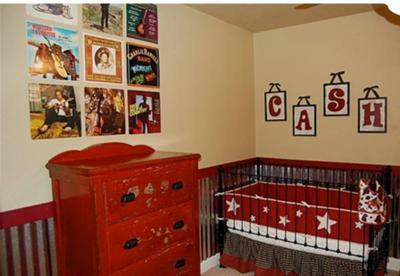 The baby crib bumper is from Pottery Barn and the bedskirt was handmade by my mom. 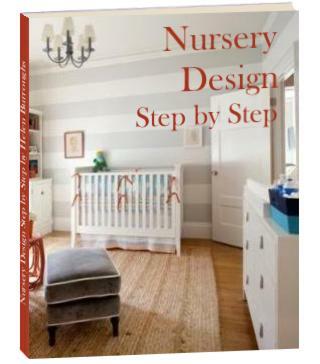 There are a lot of hand made/ do-it-yourself ideas in the nursery. The wall decor is made up of a bunch of albums that we bought for next to nothing from an estate sale. We added the Johnny Cash one in the middle at the top. We made the wall letters by spraying plain wooden ones red and then mounting them on tea stained song book sheets - my mom's idea! My mom came up with the idea for the window valance which we made from a shelf with the back broken off. We painted it red, added old records and attached sheet music material which we also tea stained to match the backing of the wall letters. The lamp was a plain black one originally. 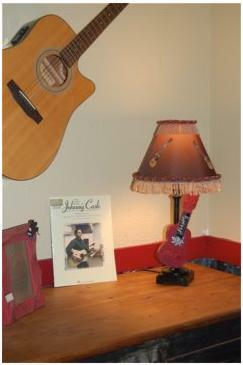 We painted parts of it, added some fringe and transformed it into a vintage music lamp! The only detail left to be added is a big red tin star above the bed. I had a lot of help from my mom! I love that it's a boy's room after having so much pink frilly around me for so long. It all came together perfectly in the end. Love, love, love this room!! Your nursery has inspired me for my little boy. I would love to find the same bumper you had but have been unsuccessful. I do have to ask, where did you find the tin for the surrounding wall??? Way clever idea!! 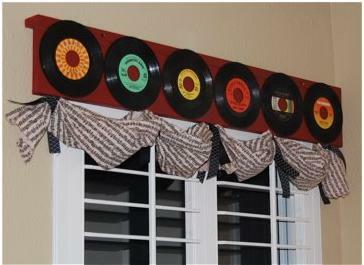 I love, love the window valance and the wall letters - what clever ideas!